TV show dates: November 5, 2017 — March 31, 2019. Performers include: Frankie Shaw, Rosie O’Donnell, Miguel Gomez, Anna Chanel Reimer, Alexandra Mary Reimer, Samara Weaving, Connie Britton, Blake Clark, Raven Goodwin, Kimberly Crossman, Mark Webber, and Mia Kaplan. 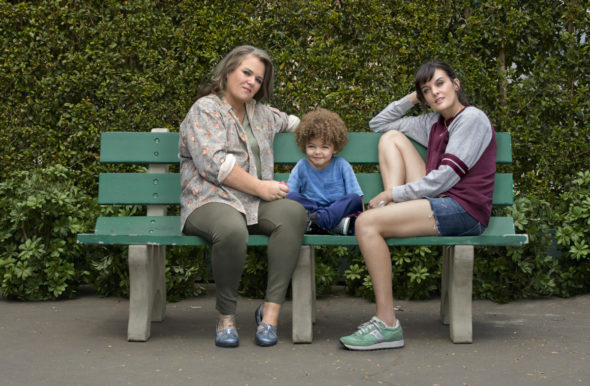 A dark, semi-autobiographical comedy from creator, writer, director and star Frankie Shaw, the SMILF TV show centers on Bridgette Bird (Shaw), a working class, South Boston single mother. Although she is striving to provide a better beginning for her son, Larry Bird (named for the former Boston Celtics player), she still has to do some growing up of her own. While this Southie native secretly dreams of a professional basketball career, between raising her child (played by the Reimer twins) and juggling several part-time jobs, she’s pretty busy. Still, this young, working class, sexual abuse survivor dreams of better things, despite challenges stemming from her social class, dysfunctional family, and more. That dysfunctional family begins with Bridgette’s mother, Tutu (O’Donnell). While she isn’t shy about yearning for “the way things used to be,” Tutu’s own past is not without its traumas. Then there’s Raffi (Gomez). Kind and empathetic, this recovering addict and Bridgette do their best to maintain a healthy co-parenting relationship for Larry Bird’s sake. Rafi does have his drawbacks, including his penchant for “get-rich-quick schemes,” not to mention his active love life. Bridgette works for the erratic Ally (Britton), whose boundary issues are second only to her debilitating devotion to self-improvement. Bridgette’s tasks including tutoring Ally’s daughter, Chloe (Kaplan). Rounding out the circle are Bridgette’s candid, practical best friend, Eliza (Goodwin); Rafi’s girlfriend, sportscaster Nelson Rose Taylor (Weaving); Kit-Cat (Crossman); and Father Eddie (Webber), the parish priest who is overly attached to Bridgette’s whole family. First aired: March 31, 2019. What do you think? Do you like the SMILF TV series? Should this Showtime TV show have been cancelled or renewed for a third season? So much fun, adding to my favorites! My wife and I like SMILF. Good scripts; great acting; refreshing! We hope it gets renewed for several seasons. Worst attempt at comedy ever done in a television series.